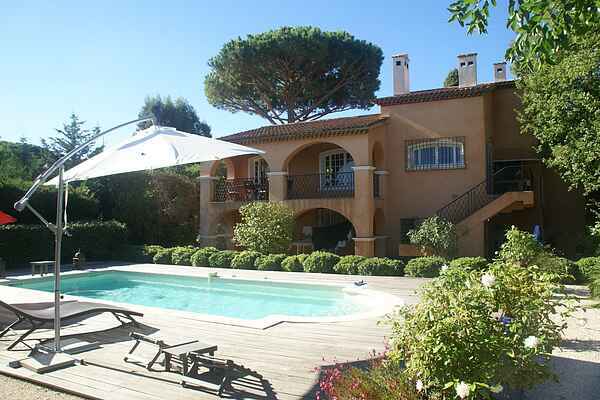 A beautiful vacation spot just 5 minutes walk from the famous Saint-Tropez (1 km). A very charming villa with private pool (9 x 4 m, depth 1.50 meters) in a quiet place with lots of privacy (the villa is situated on a domaine). Laze on your air mattress or daybed. Pure pleasure! Cozy eat on the large, shady, covered terrace with teak garden furniture. Here you can enjoy the view of the Citadelle of Saint-Tropez. Between the green pines you see the blue sea and in the distance the beautiful Alps and the red rocks of the Esterel gebergte.Op Saturday and Tuesday morning, you can walk (remember the wicker basket did not!) From the Provencal market. In the afternoon to the small but very fine museum 'L'Annonciade' where works can be admired by the painters Paul Signac (of these dots, the 'pointillism') and Matisse. In the evening, of course, to St. Tropez for the parade of Ferraris, Maseratis, beautiful people and of course the giant boats. A true spectacle! Wide, sandy beaches of Plage Pampelonne (3 km). Here's the posh lunch at the famous beach club 55.